Once upon a time, fishermen off of the Greek island of Siphnos noticed a glow under the Aegean Sea. When they trolled the spot they were amazed at what their nets brought up: a statue of the Virgin Mary. 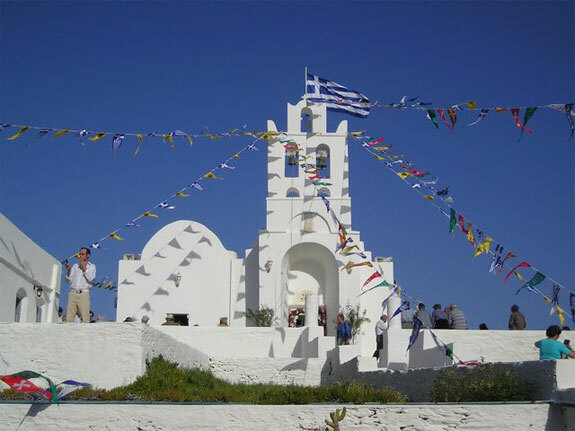 The fishermen brought the Virgin Mary icon to Chryssopigi, a small seventeenth-century monastery church on Siphnos located at the end of a spit of land jutting out into the sea. The Virgin of the Golden Spring soon came to be regarded as the protector of the island. 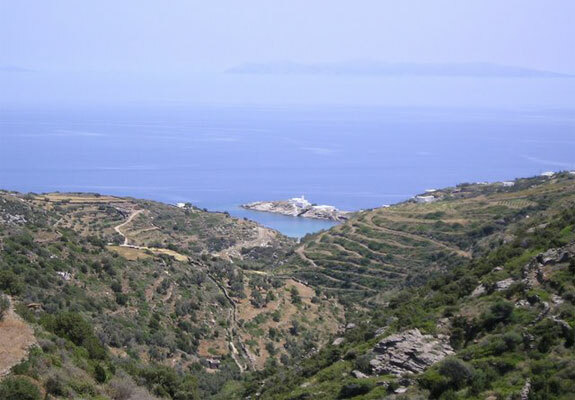 The Virgin’s protective powers were evidenced several years later when pirates, who regularly made life miserable for residents of islands in the Aegean, stormed the Siphnos shore chasing a group of nuns who were on their way to the Chryssopigi monastery. The nuns prayed as they ran with the pirates close behind. As the nuns reached the church containing the Virgin there was a great rumble, the neck of land connecting the church to the main island split open, and the pirates fell into the sea. And that’s how Siphnos came to be known as The Island of Miracles. Every year the Miracle of the Virgin is celebrated on Ascension Day, a movable feast that falls in late May or early June. On this day the icon leaves its home in Chryssopigi and is hand carried to the port of Kamares. Small churches on the island take turns with the honor of caring for the icon along the way. From Kamares the icon begins its symbolic journey home. 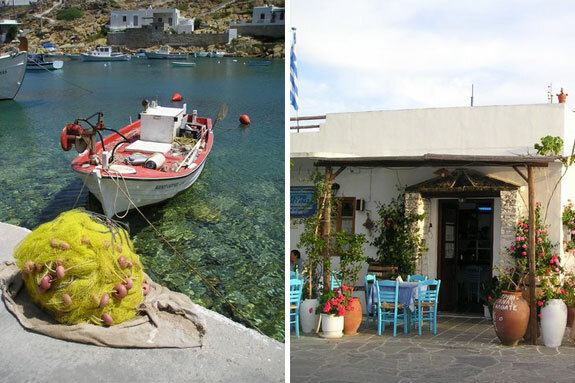 A commercial ferry boat changes its route on this one day in order to bring the icon back to Chryssopigi. The ferry also carries a coterie of church dignitaries in long colorful robes. When the icon is returned it is welcomed back by a majority of Siphnos’s 2000 residents, old men and women in black, young children in their best clothes, wealthy Athenians and a small handful of tourists. The crowd gathers on the bridge that today connects Chryssopigi to the south end of Siphnos. Blue and white pennants wave from lines strung from church roof to surrounding walls. Flowers frame the church’s doorway. The aroma of baked lentils creeps out of the narrow dining room. The whole of Ascension Day takes on a vibe that’s a mix of a family reunion, celebrity-watching and a festival. The day ends with an all-night feast and drinking party—Greeks take their religion seriously, but not solemnly. 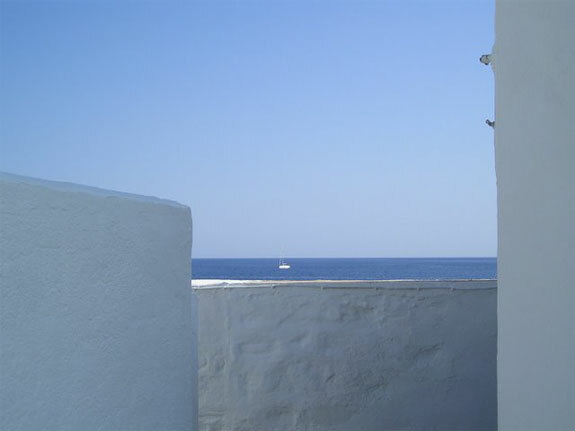 During the rest of the year Siphnos (often spelled “Sifnos”) is much more quiet and laid-back. To enjoy the peaceful island at its best arrive between September and June. In July and August the pensiones and small hotels are filled. 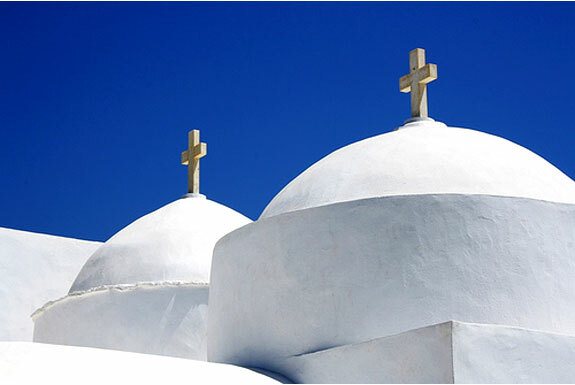 More than 300 churches, chapels and monasteries dot the island, some so small they hold only one person at a time. The white-washed chapels with bright blue doors decorate the pastures and rocky hillsides like snowy linen handkerchiefs dropped by a passerby. Although the island’s road network reached the last of the isolated seacoast fishing villages twenty years ago, walking is still the best way to experience the island. 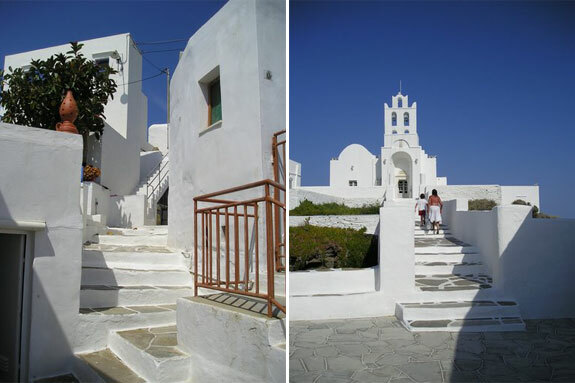 For a true Siphnos experience stop by the small tourist office by the ferry boat landing, buy one of their excellent Siphnos walking path maps, and set out by foot to explore the Island of Miracles. I spent a wonderful 3 summers working on this Island back in the mid 90’s. I highly recommend a visit. Siphnos sure sounds great. But aren’t there hundreds of other Greek islands? Seems like it would be hard to know what one to go to. Glad you share my love of Greece. Yes,Cherry, Siphnos is an amazing place. 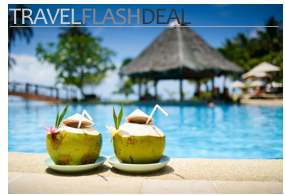 Not for those looking for all night partying, but for those who would like the more relaxed “real” island life. LOVELY photos, oh so blue!! interesting to learn the history. thanks!! I love old-world Greece. Thanks for the trip to this wonderful island.